Screenshot from a Jesus March promotional video on the Kingdom Nation website (www.kingdomnation.co.za). 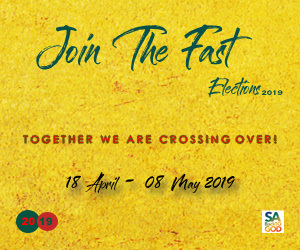 Christians in cities and towns throughout South Africa are expected to participate in Jesus Marches on Saturday April 27 in a display of unity and servant-heartedness, linked to a so-called “Christian great awakening” in the nation ahead of the May elections. Organisers have asked marchers to wear white as a symbol of cleansing SA, spreading a message of peace, and being a light to the nation. Marchers are also asked to bring black bags to clean the approximately 3.5km routes as they march along, prayerfully. The event organisers are calling the day of the march, which is taking place on the Freedom Day public holiday, “True Freedom Day” because “only in Christ can we be truly free”. 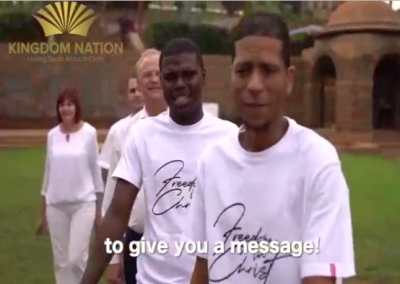 In a video promoting the Jesus March, posted on the Kingdom Nation website (www.kingdomnation.co.za), organisers urge Christians to wear white, again, on Election Day — and to vote according to their values and beliefs. A Christian Consensus campaign built around what many Christians say they want for SA was one of the sparks of the current awakening. It contributed to seeing more than 400 Christian leaders signing a Kingdom Nation Declaration in Pretoria on Saturday, 6 April. They committed themselves to work towards realising Kingdom principles in South Africa, as outlined in the Declaration. Dr Pearl Kupe is one of the key leaders in this initiative. Initiator of the Christian Consensus campaign, Dr Arno van Niekerk, said it is now endorsed by more than 2 million people — and numbers are growing daily. He said the number of towns participating and people registering for the Jesus Marches is growing by the hour, with Christians across the racial, cultural and denominational spectrum uniting to express their faith in love and kindness and truth on April 27. Preparations for the various marches and a mass meeting and march at Mount Zion, Germiston, are proceeding well. General information about the Jesus March, as well as about the different march locations, can be found on the Kingdom Nation website (www.kingdomnation.co.za). Port Elizabeth prayer coordinator Pastor Joan Keeling informed Gateway News that the city’s Jesus March will be held on Sunday April 28 because the DA have already booked the 27th for a march and the municipality only allows one march in the city per day. “We are experiencing an amazing time in our South African Church History — truly an Awakening of the Church in the country!,” she said at the top of a note on meetings lined up in PE from Thursday April 25 to Sunday April 28. This meeting, which will be addressed by Bible teacher Dr Arthur Frost, who is currently on a trip to mobilise Kingdom Nation prayer warriors throughout SA, will be live-streamed and be used to inform, instruct and mobilise believers in villages, cities and metros throughout SA. Friday April 26 at 9:30am to 11am — All those with a heart to pray for God to bless NMB and SA are invited to attend the End-of-the-Month Prayer Warriors’ Prayer Gathering at GAP Church. Saturday April 27 at 9.30am for 10am at Word Of Faith Christian Centre, local Christians are invited to pray and watch the Mount Zion mass meeting and marches around the country via live-streaming and to stand together with those in other centres in dedicating their lives and nation to God. Sunday April 28 at 1.30pm, Christians, dressed in white, are to assemble at the King’s Beach carpark to march to Something Good, proclaiming their faith and trust in the Lord and dedicate themselves to pray for the nation to be dedicated to the Lord. There will be a time of prayer and worship in the carpark at Something Good. Those who are not able to march may join the event at Something Good. Nobody may join or leave the march along the way. More info on this Jesus March is available from: Pete ( Convenor — 083 6574213), Gershwin (082 9304572), Joan (0847662270). For more info on the nation-wide Jesus Marches contact Bernadette (078 1374346). I would like to know of any marches taking place on the 27th April in Durban or Pinetown? There is no list of places where marches will be held. Please supply!